LLNL is located at 7000 East Avenue in Livermore, California, a community in the Tri-Valley area of Northern California, about 45 miles east of San Francisco. In Figure 10-1, directions are given for visitors traveling from the three area airports: Oakland, San Francisco, and San Jose. 511 SF Bay Area (http://www.511.org/) provides instant online access to road, rail, and water transit information for the nine-county San Francisco Bay Area. Note that all visitors to LLNL must first check in at the Westgate Badge Office. Those funded for travel by LLNL need to follow the U.S. carrier rules and DOE government guideline rates. Figure 10-1. 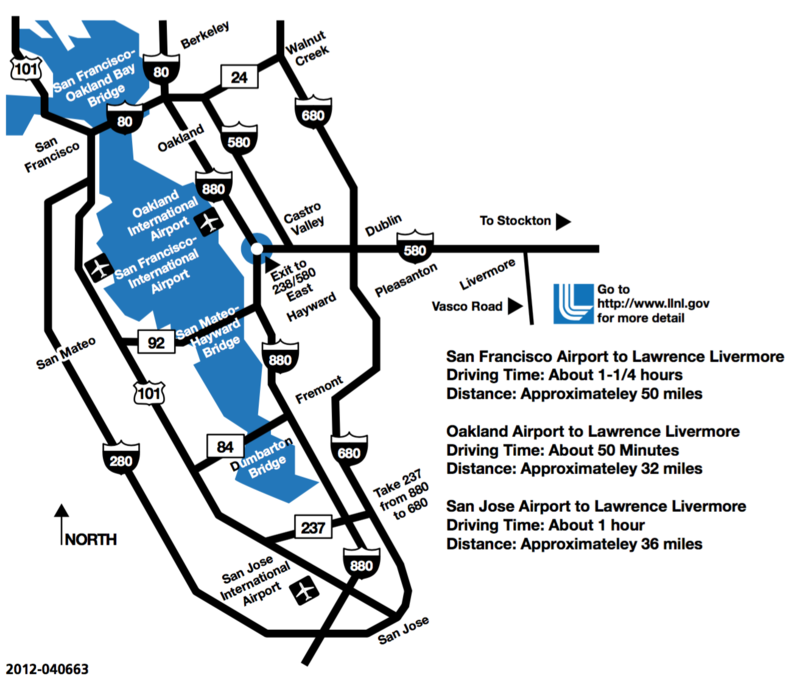 (Right) Map of the San Francisco Bay Area and transportation routes to LLNL.